United Kingdom has very simple rules concerning window tint. If you’re looking to install window tint in UK the law permits the following visible light transmission (VLT). Windshield must have over 75% light transmission. Front side windows must have at least 30% VLT. All windows behind driver can have any tint darkness. Front windshield of a vehicle must have over 75% VLT, meaning it must pass through more than 75% of light through the glass. Side windows next to driver must have at least 70% VLT, therefore these windows must not block more than 30% of total light. Any windows to the back of the driver can have any level of window it. There are no UK laws restricting any level of darkness on these windows. Like back side windows, United Kingdom laws do not restrict level of darkness on rear windshield. Any level of window tint is legally permitted. See also: How much is 70% VLT? Regulations above pertain only to vehicles first used after 1 April 1985. If your car is older you may use up to 70% Visible Light Transmission on front windshield and front side windows. Feel free to download or share the image, but please leave our credits intact. Thank you! In United Kingdom having illegal window tint is punishable by law. Police or DVSA can measure your window darkness with a photometer, and police officers are equipped with these devices with increasing frequency. Unless you use extreme tint darkness you will likely be issued with an EFPN notice (Endorseable Fixed Penalty Notice), resulting in your drivers license endorsed with 3 points and a £60 fine. Delayed Prohibition Notices or Rectification Notices are received most often by drivers with prohibited car tint. These are typically issued for tint which is not legal but passes more than 30% of light. These notices will enable you to drive (usually for up to 10 days), but you are required to remove all non-legal tint and provide proof to a police station. Illegal car window tint on windshields and front side windows which is considered extreme (less than 30% light transmission) can result in a “Prohibition Notice, ordering you to stop using the vehicle until it complies with UK window tint laws. It is a serious offence to ignore this notice and you are likely to be prosecuted for driving non-roadworthy vehicle. Furthermore you can also receive a penalty notice or court summons, both of which incur additional costs. In UK it is also illegal to sell a vehicle with non-compliant window tint, and police or trading standards can prosecute you for it by law. You should also consider notifying your car insurance company about your window tint even when within legal limits. Your future claims may be invalidated as insurance companies can consider it a car modification. 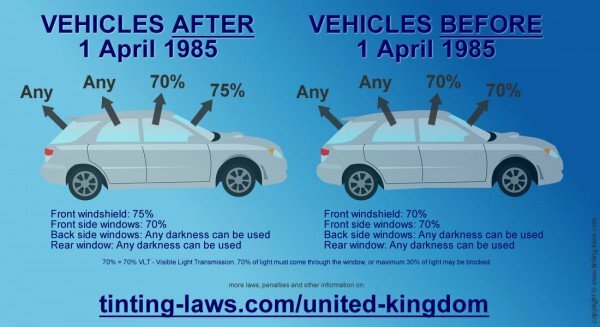 Window tint darkness is also not part of your MOT test. This means your vehicle may pass the test even with illegal tint, and passing MOT testing can not be used as defence for illegal window tint. If you are involved in an accident at night, illegal window tint can even be used as evidence towards a careless driving charge. For all these reasons we strongly advise never breaking the law and always ensure your car windows are tinted legally. United Kingdom has very clearly defined laws for window tint. Front windshield and front side windows may have up to 75% and 70% light transmission respectively, and all windows to the back of the driver can have any tint darkness levels. In case you’re driving a vehicle which was first used before 1985, windshield may be tinted with 70% light transmission. These cases are becoming rare, as most owners of old-timers don’t tint their vehicle windows. UK laws do note make distinctions for vehicle types, so these regulations are valid for sedans, but also pick-up trucks, SUVs, and other vehicle types. In addition the entire United Kingdom has the same legislation. Great Britain’s England, Scotland and Wales, but also Northern Ireland all have same window tinting laws. Our information about UK Window Tint Laws was last updated and verified in 2018 and 2019. Our articles are constantly checked for accuracy by our partnered UK traffic law experts, but in case any of our info provided is not up to date or correct be sure to contact us so we can fix it. Thanks! To learn more about window tint and laws be sure to check some of our articles! Tint Darkness Percent Examples - find out how VLT works and how various levels of light transmission look. Benefits of Tinting Car Windows - aside from aesthetic reasons there are functional benefits to tinted windows. How to Clean Tinted Windows - see how to properly clean tinted windows to preserve foil longevity.